Are you getting the best ride possible on your snowmobile? One of the biggest mistakes that any new rider can make is assuming that the dealer set his or her sled up correctly. In reality, many of the sleds you probably see on the trail do not have the suspension set up properly. Dealers typically leave suspension setup to the owners, because it does depend entirely on the owner's riding style. Unfortunately, many riders do not know how to adjust snowmobile suspension on their own. Luckily, we can help. The suspension setup of your sled is an important matter of choice and you will also have to pay attention to the riding conditions of the day. In this guide, we take a closer look at snowmobile suspension and explain how to adjust your setup in just a few easy steps. Part of being a responsible snowmobiling enthusiast is knowing how your machine actually works. A sled's suspension, for example, maximizes traction by moving up and down in both the front and the back independently to keep the length of the track on the snow without bridging the gaps. When it comes to racing over those powdery hills or punching the throttle, the power of the engine and the angle of the hill cause the weight of the sled to transfer to the rear suspension in order to gain the most traction. All these movements are carefully calibrated by sled manufacturers and aftermarket companies with the proper combination of suspension arm length, mounting point, shock valving, and spring rates to ensure a smooth ride on the trail and reliability in the backcountry. When you buy a brand-new sled, the suspension is typically set up according to the typical riding style expected of that specific model. In most circumstances, the stock suspension that comes with your sled is not calibrated for your weight, which can result in trenching when you take off from a stop or climb a steep hill. Your sled may also ride pretty rough on the trail and cause bad handling. If the stock suspension is too soft, your snowmobile will lose its ground clearance and drag on the running boards. A stiff suspension will spin and feel like it has no traction. Aftermarket may be the right solution for you, but you can always try making adjustments to the stock suspension that came with your sled. You may only need to adjust the rear springs in order to get the correct amount of rear sag. Just remember, whenever you make a change to the front of your sled, that change will affect the rear of the sled as well and vice versa. You should only make small incremental changes with the overall balance of the sled in mind. Otherwise, you run the risk of creating a new problem by trying to solve another problem. The single most important adjustment you will need to make is matching the sled to your weight. You will need to adjust the rear sag so that it accommodates your weight and your gear combined. As a rule of thumb, add 15 to 30 pounds for your gear and equipment. You can ask your dealer for a recommendation if the OEM does not specify rider weights. 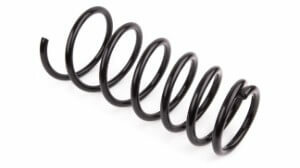 You should re-valve your stock shocks to match the newly adjusted springs and produce the proper spring rate. You may want to replace the shocks on your stock suspension with a custom-calibrated set of aftermarket shocks that come fully equipped with external adjustments, such as compression and rebound adjusters. Now, take note of the snow and trail conditions. You should pay close attention to how the front skis feel through the handlebars, how the center shock and front arm feel through the running boards at your feet, and how the rear shock and rear arm feel through the seat. Based on how the sled feels and performs, you can find the perfect adjustment. One other option you have is to replace the entire suspension with an aftermarket one, which will likely offer all the shock improvements and adjustability features you need to enjoy a smoother ride than a stock suspension can provide. Now that you know how to adjust snowmobile suspension, it's high time that you find out what your sled is truly capable of. At Polaris Parts Nation, we make it easy for you to find OEM or aftermarket shocks and suspension kits for an affordable price. We keep our inventory stocked with top products made specifically for Polaris sled models, including the INDY, RMK, RUSH, SKS, Switchback, TITAN, Voyageur, and WideTrak, just to name a few. Please feel free to contact us with any questions about this guide or our inventory.